I wrote this story for The Orange County Register. It was published on Feb. 18, 1992. I read that the owner of the well providing this “miracle water” died of cancer in 2004. TLACOTE, Mexico – Thin and frail, Ezequiel Lopez inched along in a wheelchair, a plastic jug in his lap, hope in his heart. The water bubbles up from a 792-foot well, and believers say it dissolves tumors, kills viruses and mends broken bones. Word of the precious liquid has swept through the barrios, not only in Mexico, but in Santa Ana and Anaheim, in Long Beach and Los Angeles. Everyone’s talking about it. Everyone’s got to have some. But getting it isn’t easy. Water seekers wait as many as four days in a winding line that stretches more than a mile. Two travelers died of their illnesses before reaching the front of the line, Mexican police say. Four people have been hit by cars on the country road leading to the ranch. And dozens have nearly frozen to death during the cold nights. Lopez, 52, has diabetes, and gangrene is eating away his fingers and toes. “All that has life, the water helps,” he said on a recent afternoon. Chahin, 51, comes from a wealthy Arab family that owns 17 steel and plastics factories throughout Mexico. About 10 years ago, he sold an herbal treatment for cancer in Mexico. But the remedy cured no one, Mexican Health Ministry spokesman Eduardo Arvizu Marin said. Critics say Chahin’s latest miracle _ the water _ raises hopes only to send them crashing down. An analysis by Water Test Corp. in Manchester, NH, that Chahin arranged showed that Tlacote water is high in minerals but has no unusual properties. “If it’s got something unique in it, we didn’t find it,” company President Jerry Tone said. His ranch is on the edge of Tlacote, a town of 5,000 people about 150 miles northwest of Mexico City. He said he discovered the water’s powers seven years ago. A mutt named Lucas, injured in a dog fight, fell into a tub of it and his scars disappeared, he said. In March, Chahin started giving away the water, saying it contained mysterious healing ingredients. Mexican newspapers wrote about it and the word spread. Now, the two-lane road leading to his 568-acre ranch is jammed with tour buses and cars. More than 10,000 people are lined up for water night and day. Vendors sell provisions _ steaming tamales, coffee, blankets. Water seekers write their names on their jugs and run pieces of rope through the handles so no one can cut in line. But some people creep in at night and untie the ropes, slipping empty containers on. Fights sometimes break out and there are long arguments, with people yelling and crying. Volunteers, who trade their labor for water, try to keep order. The nights are icy cold. Jug vendor Leticia Rodriguez, 28, built a shelter out of empty containers, and stuck her 3-year-old daughter inside. Avigail Cabrerra, 33, of Guerrero, Mexico, huddled under a wool blanket. Believers endure these hardships with quiet determination. “We have a lot of faith,” said Juan Manuel Ortiz, 47, a Santa Ana carpenter back at the well a second time. He has leukemia and is thin and haggard at 160 pounds. He has been drinking the water for two weeks, one glass every two hours. “I’m not all well, but I’m better,” he said, smiling weakly. Water seekers believe the more they suffer, the stronger the cure. “It’s part of the magic,” said Sergio Velazquez, 49, editor of Miniondas, a Spanish-language newspaper in Santa Ana. He flew in to pick up 20 gallons of water for three of his readers who are sick. “Here’s where faith begins,” he said, surveying the long line. Many of those in line said they had tried traditional medicine, but it didn’t cure them. Or it was too expensive. Or too painful. “I’ve already been operated on once. I don’t want another operation,” said Marta Jimenez of Reseda. She drinks the water every day and rubs it on her breasts to fight cancer. Irene Cardona, 60, of Guadalajara, Mexico, wanted water for her ulcer _ and for her 8-year-old chihuahua, Principe. Artemio Rodriguez Rubio, 43, a Mexican farmer who was getting water for his father, was one of the few skeptics. Chahin’s ranch is surrounded by a stone wall and chain-link fence topped with barbed wire. Guards make sure that no one gets in without a token, a numbered slip given to people in line. The metal gates are opened at least every half hour and 40 or 50 people rush in. The water flows from rows of faucets hanging from 16 steel tanks, some holding as many as 20,800 gallons. “presciptions” _ 10 gallons or more for AIDS, leprosy and cancer, just over a gallon for less serious illnesses. Luisa Dolores Lozano, a teacher’s aide from Los Angeles, said she waited in line for three days, but got only a few gallons of water for her son, Amado, 15, who has leukemia. And one jug of water cost her $33. “It’s supposed to be free,” she said angrily. Chahin immediately sent out workers to find the volunteer who was selling water. Then he told Lozano that he was sorry and gave her 52 gallons to take home. Chahin said the water is free, but people keep trying to sell it. Already, 96 volunteers have been dismissed for selling it on the side, he said. 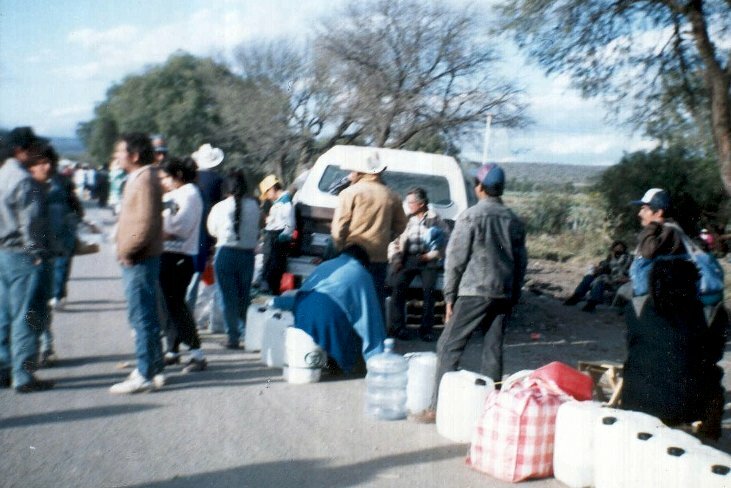 Tlacote water is in great demand. Jose Luis Romano, of Aguascalientes, Mexico, found some at a well next to a yellow and orange church near Chahin’s ranch. “They say this is the same water,” he whispered, busily filling jugs, milk containers, an aluminum pot, a pitcher and a mayonnaise jar. The Mexican Attorney’s General’s Office is looking into claims that someone is selling tap water in Mexico City and saying it is from Tlacote. The going price: $25 to $100 per jug. Chahin said he wants to commercialize his operation some day, maybe in two or three years. But first he wants to document its healing powers. In a room next to the shiny steel tanks, he keeps thousands of files that track the progress of his “patients.” The files are color-coded _ blue for general diseases, green for cancer and yellow for diabetes. File No. 240 lists a patient named Evangelina Hernandez, 27, of Queretaro, Mexico. It says the water improved her eyesight, got rid of the tic in her left eye and cured an intestinal infection. She also lost 11 pounds. Chahin said the water purifies the blood, and his followers believe it. “You drink it and you feel like you just brushed your teeth,” said Florencio Contreras, 62, a tractor operator from Blythe who drove more than 50 hours to get here. But Chahin warns that the water has side effects: diarrhea on the first day, smelly urine on the third or fourth day. And one believer said it makes some people vomit mud. Full-page newspaper stories about the water’s strange powers line the walls of Chahin’s file room. They are glowing accounts, telling how Chahin’s water has cured AIDS, cancer and leukemia. Reporters who write negative stories are banished from the ranch. El Tiempo newspaper in Ciudad Mante printed a special edition and sold it in the line. The paper claimed that the rich and famous _ even former President Reagan _ had been dropping by for the water. And in the throng of believers, these tall tales abound. “You hear about Magic Johnson? He was here, too,” said Javier Enriquez, 29, a construction worker who drove in from Chicago, a 42-hour trip. Ezequiel Lopez, the door maker who was getting around in a wheelchair, returned from Tlacote and checked into a hospital. The gangrene had gotten so bad that doctors had to remove his left forefinger. Now home in Orange, Lopez said he feels fine and has stopped using the wheelchair.